It doesn't take a six course meal to please me. Just mentioning in case I am invited to break bread with you :D Simple, satisfying comfort food is what I crave most for. I find that much against my will, my tummy growls louder and earlier than usual when its one of these dishes on my dining table. Soppina Palya and steaming Tomato Rasam, Spicy, vegetable loaded Bisi Bele Bhat and Sandige, piping hot rice with Menasinakyi Raitha, Stuffed Brinjals and chapatis to name a few. Another all time favorite, filling and easy meal I love is Majjige Huli (a kind of yogurt gravy) simmered with Nucchina Unde. 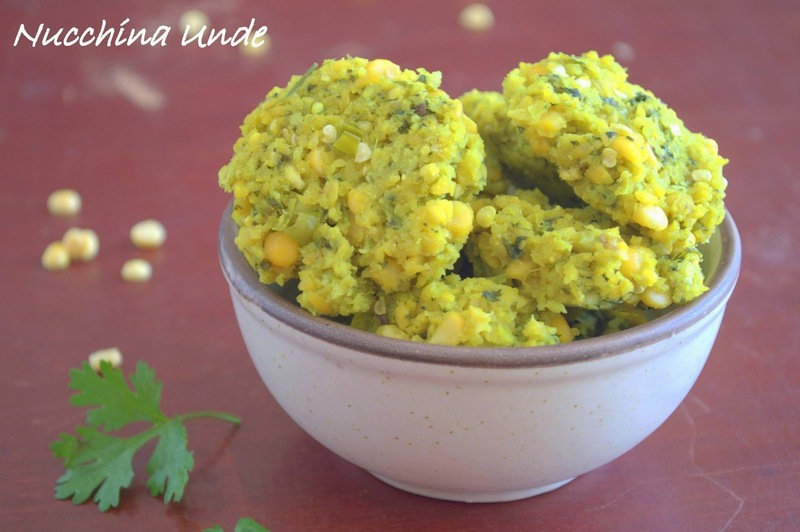 Ingredient wise, Nucchina Unde is similar to the more popular, deep fried Masala Vadas of South India. 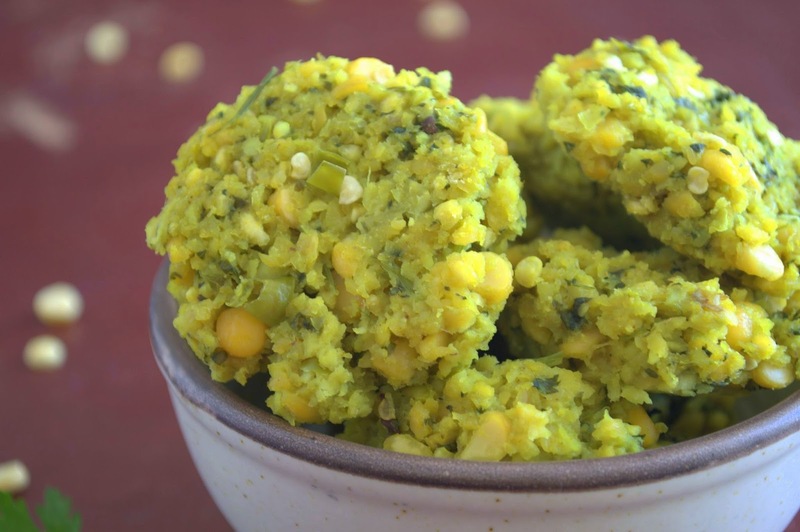 Bengal gram dal, fresh coconut, green chillies, hing, turmeric are ground to a coarse paste and made into dumplings and steamed. Sometimes even a mixture of lentils like Bengal gram dal, moong dal and toor dal are used in different proportions. I like to use coriander, dill / mint and onion are also used. You could shape them into flat discs or into oblong shapes as you please. You can eat these as a snack as is or with coconut chutney. Or crumble them into steamed rice and melted ghee. Even better, simmer them for a few minutes in Majjige Huli and serve with rice. That's my favorite way of eating these dumplings. Deep fried chickpea bondas in yogurt gravy is delicious too, but these lighter steamed ones are way friendlier during hot Indian summers. Light on your stomach and no sweating over deep-frying them. You will hardly need more than 20 minutes to put these on the table if you remember to soak the lentils ahead. The important thing is not to grind the lentils too much or add water as that will make them hard. Ingredients: To make about 12 dumplings. If doubling the recipe, grind in two batches. Bengal Gram Dal - Chana Dal - 1/2 cup. Wash and soak the lentils for 3-4 hours or even better overnight. Drain and rinse well. Drain out all water again, making sure there is absolutely no water left. Put all the ingredients (no water) in the medium sized jar of your blender and grind at speed 1 for just 10 seconds. Open the lid, mix with a spoon. The mixture should be coarse, a few whole grains of dal or bits of chillies is just fine. If absolutely needed, process again 5-10 seconds. If you make a paste of it, you may not love the dumplings. Taste to check if you need more seasoning like salt or ginger. If necessary, just add more of these to the ground mixture, do not grind the mixture again. If you need more chillies, either chop fine and add or grind separately and mix. Lightly grease idli plates. Make about 12 small portions of the mixture and place in the plate, flatten slightly. Steam on high heat for about 12-14 minutes and check to make sure the dumplings are not doughy. Do not steam much longer as they may feel very dry. 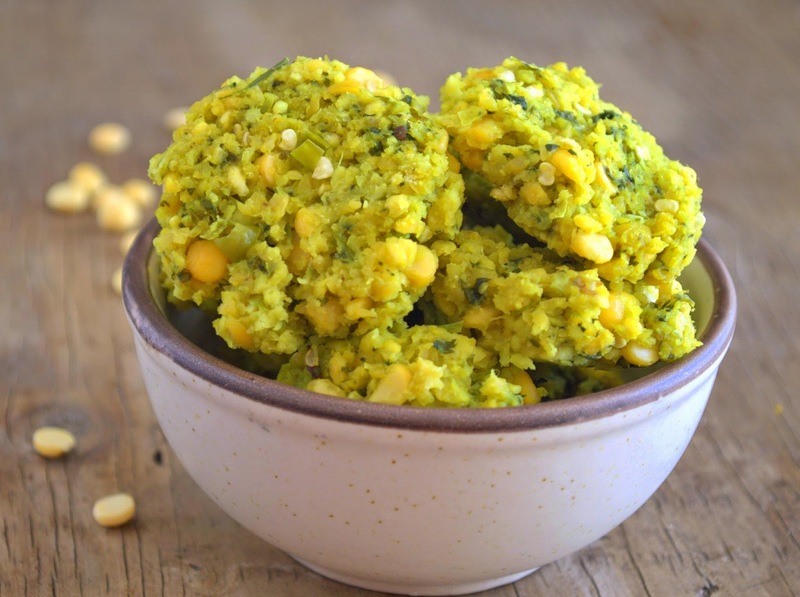 Serve warm or at room temperature with coconut chutney. Or simmer in Majjige Huli for 5 minutes. Tell me your favorite summer savory dishes? Wow! That was simple and oil free!!! Fragrant coriander, aromatic hing, steamed 'unde' - what's not to like? And I will be delighted to break bread or share a rice bowl or break pav or anything with you, so don't wait, just come over! And let me pamper your growling tummy!